Welcome to another edition of Feminist Friday! This week we’re taking our feminism in an area that is too often overlooked in the focus on social justice and gender equality – incarceration. Most of us are familiar with the data around America being home to the highest prison population on the planet, and that the majority of people incarcerated are black men. But what is little known is that women are actually the fastest growing prison population, which carries all sorts of far-reaching social, health and family problems that make this a systemic issue. Today we’re highlighting 3 documentaries that are tackling the tough issues, two of which are specifically talking about the effect of the prison system on women and their families, and other focusing on the opioid epidemic sweeping America and how the prison system is closely tied into how this problem is compounding the problem. 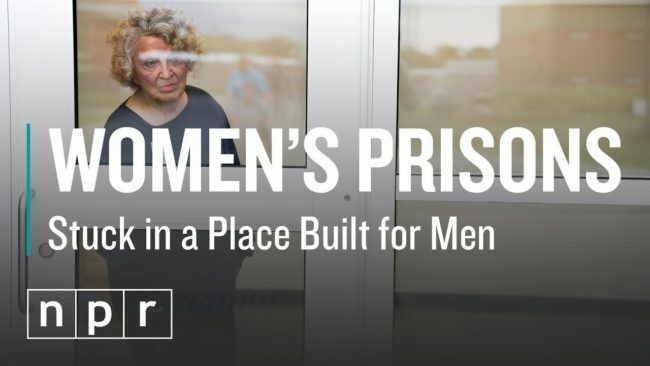 The first documentary comes from NPR, who investigated the way prison punishment affects women much worse than men, in a system wholly designed to incarcerate men and not accommodate the different situations of women (including the fact that many women in prison are the primary care-givers of children, a number of them being minor children). “Across the country, women in prison are disciplined at higher rates than men — often two to three times more often, and sometimes more — for smaller infractions of prison rules…In California, between January 2016 and February 2018, women had the equivalent of 1,483 years added to their sentences through good-credit revocations, and at a higher rate than for male prisoners, according to the data we collected,” said the article, with reporting from Joseph Shapiro and Jessica Pupovac. The second video is the trailer to a documentary called ‘The Providers‘ from filmmakers Laura Green and Anna Moot-Levin. The film follows three healthcare providers in northern New Mexico where they work at El Centro, a group of safety-net clinics that offer care to all who walk through the doors, regardless of ability to pay. Amidst personal struggles that reflect those of their patients, the journeys of the providers unfold as they work to reach rural Americans who would otherwise be left out of the healthcare system. With intimate access, the documentary shows the transformative power of providers’ relationships with marginalized patients. In a press statement about their award-winning documentary, the filmmakers talk about the urgency of their subject matter right now given the political and discursive tension over the future of American healthcare. “New Mexico is one of the country’s poorest and most rural states and opted to expand medicaid under the ACA. However, the challenges in rural healthcare go far beyond the ameliorating effects of the ACA. ‘The Providers’ reflects the ways poor health is created at the structural level by a lack of public health resources and access to care – in 2016, there were 70,000 preventable deaths in rural areas, and on average life expectancy in rural areas is two years shorter than in urban areas,” they say. The final video we want to share this week is the trailer for a powerful documentary out now on HBO called ‘The Sentence‘ which explores the devastating consequences of mass incarceration and mandatory minimum drug sentencing through the story of Cindy Shank, a mother of three young children serving a 15-year sentence in federal prison for her tangential involvement in a Michigan drug ring years before. A lyrical, intimate story documented over 10 years by Cindy’s younger brother, filmmaker Rudy Valdez, ‘The Sentence’ follows Cindy’s struggles to be present in her children’s lives from behind bars and her daughters’ experiences growing up without their mother at home, while her husband, parents and siblings fight for her release before the last months of the Obama administration’s Clemency Project. This film won the 2018 Audience Award at the Sundance Film Festival before being acquired by HBO. This documentary, along with the two others in this week’s column are an eye-opening reminder we still have a long way to go in our society in terms of better helping mothers and children, and it begins with awareness of systemic problems and how we can use our voices and our votes to affect change.